The Acores - fascinating, beautiful and exciting! Are the Acores a part of the sunken Atlantis? Many people thinks so, but noting is proved, yet. 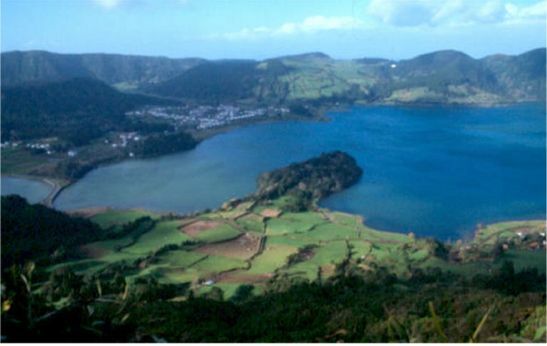 It is easy to believe the legend when you see the beauty of the island Sao Miguel. If you are looking for magnificent and beautiful nature, clean air, want to meet friendly people and fly away from the stress the Acores is the right place to go. The Acores consists of nine small islands located far out in the Atlantic Ocean, half way between Europe and North America. The islands were created after a volcanic undersea eruption. The islands were discovered between 1432 - 57, ten years after the discovery of Madeira, by portuguese seafarers under the lead of Goncalo Velho. 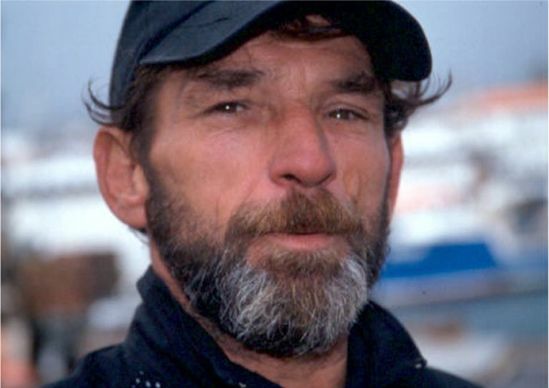 The first islands he discoverd were Santa Maria and Sao Miguel. Santa Maria was named after the first settler. In 1444 Sao Miguel was settled. The first settlers came from Portugal and France. The french settlement is confirmed by the name of a small village called Brethana, wich probably is meaning that people came from Brittany. The portuguese named the islands after all the raptorial birds that hovered over them at arrival. They thougth it were kites, who are called acores in portuguese. The birds were hawks, but the name of the islands was not changed. The Acores have always had a strategic location. During the war with Spain, 1580 - 1640, the islands were used as a base for defence and attacks. Also during the war 1820-34 the islands played an important role. During a long period the island Santa Maria was an important landingplace for planes flying between Europe and North America. During World War II the Acores were a place of importance for the Allies troops. 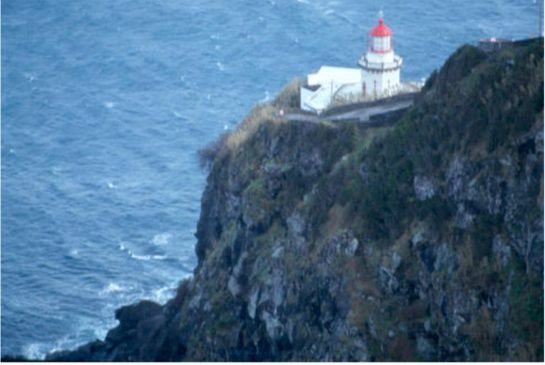 The Acores is an autonomic region belonging to Portugal and are members of EU. 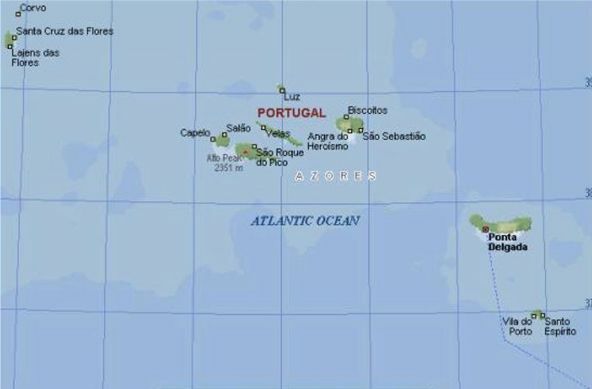 The Acores consists of nine islands located in the Atlantic Ocean, betweeen Europe and North America, approximately 1 300 kilometres west of Lisbon. The total surface of the islands is 2 333 square kilometres. They are divided in three main groups. 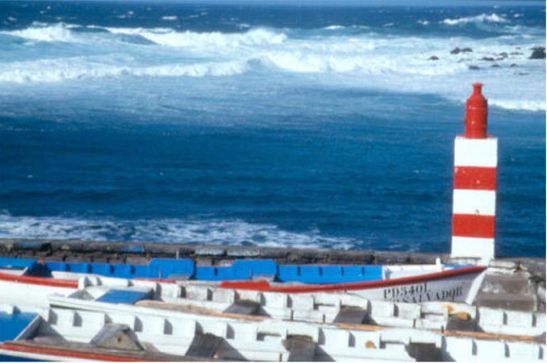 Sao Miguel is the largest island (747 square kilometres). 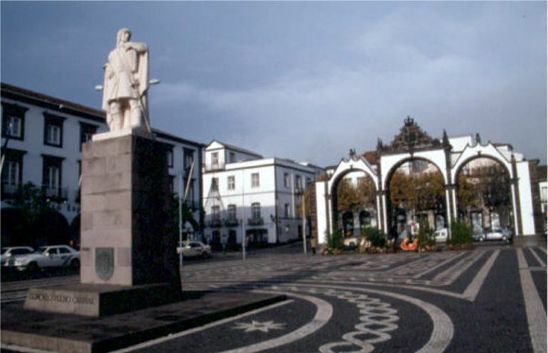 The regional capital Ponta Delgada, with approx. 130 000 inhabitants, is located on this island. The total population of The Acores is approx. 250 000. Portugals highest mountain Pico, 2 351 meters, is located on the island of Pico. 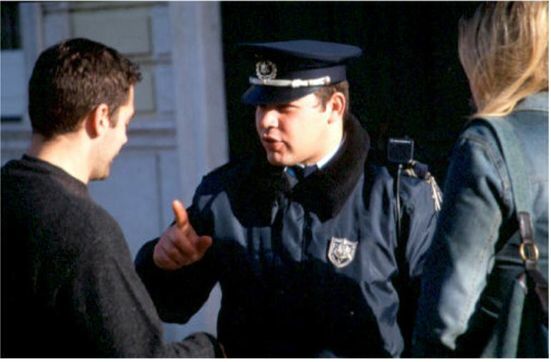 The high ambitions of the local governement to protect the environment was rewarded by EU in 1995. There are National Parks or protected landscapeareas on all islands. They all have unique landscapes with luxuriant greenery and abundant occurrence of flowers. Volcanic eruptions have created many beautiful crater lakes. Approximately 850 differents plants and flowers have been found on the Acores, 56 of them are endemic. Additional more than 400 moss and lichens have been found. For the botanists the islands are of great interest. The largets, landliving, mamals are rabbits and rats. 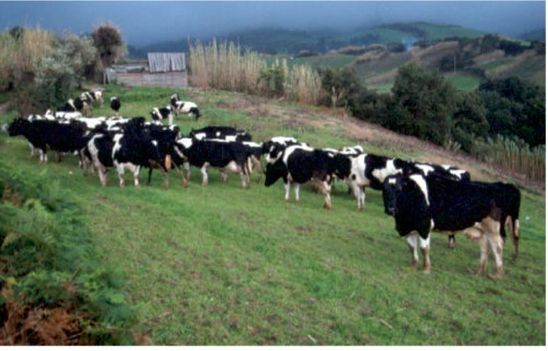 The most common mamal on the islands are cows. I heard that there are more than 110 000 cows, so you see them everywhere. 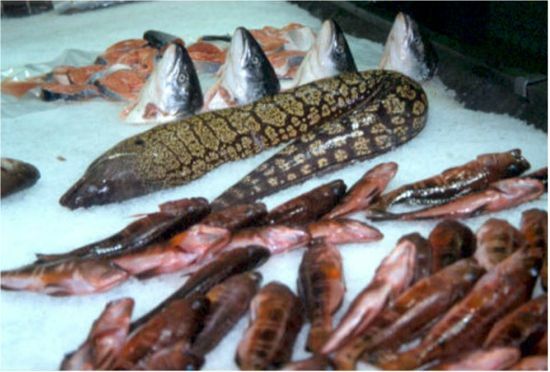 The sea around the islands are rich in differents kinds of fishes and shellfish. If you are lucky you can alse see wales and dolphins. I have, during a long time, heard about the good trekking possibilities on the Acores, since than I wanted to go there, as I like trekking. I studied some brochures to find out where to go and found out that there are no longer trails to trekk. 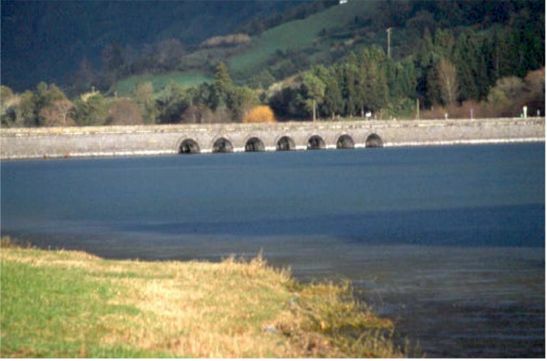 In the Sete Cidades area you have the best possibility to make longer day trekks. 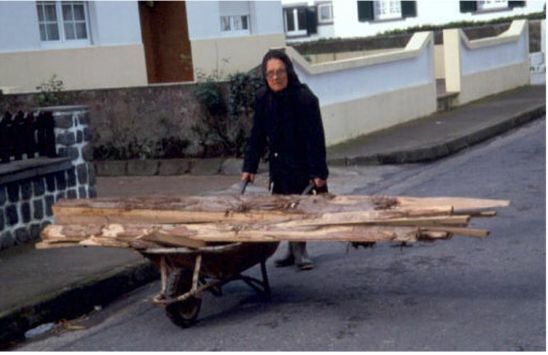 If you are used to walk for several days, sleeping in tents or huts, the Acores are not the right place to go. Anyhow, you always walk with fantastic views over beautiful landscpapes which makes the walks to a great experience. If you look for new trekking environment the Acores are good for a week or two, but according to my opinion Madeira offers better possibilities. I spent one week on the main island Sao Miguel in December, which is really not the best months to visit the Acores if you look for fine weather. As December is one of the wintermonths it is often rainy and windy. You will find the best weather in the costal areas. During my visit the mountains often were hidden in heavy fog. In spite of this, I was able to make some nice trekks and explored the island and really enjoyed my stay. The weather you have to accept as it is. The regional capital Ponta Delgada, with approximately 40 000 inhabitants, was my base. From here it is easy to go with local busses to different trekking areas. If you rent a car you can reach places where no busses go and you are totally independent to move around. Ponta Delgada is a nice little town with old poruguese colonial houses. The town is calm and clean. The main street is Avenida Infante Don Henrique, which follows the sea. There are some nice churches to visit. The most interesting, according to my opinion, were The Church of Sao Jose and the Cathedral Igreja Matriz de Sao Sebastiao. The big fort Sao Bras from the 14th century is located close to the harbour. Regretfully it is not open to the public. During my round trip with a rented car I followed the south coast out from Ponta Delgada. Driving on Sao Miguel is an interisting experience as the roads very often are narrow and winding, so you better drive carefully. Drive slowly and enjoy the beuatiful scenery. Take the opportunity to visit some of the small towns or villages you pass when driving. Vila Franca do Campo was the first capital on Sao Miguel but was, more or less totally destroyed, of the volcanic eruption in 1522. Today it is a nice little town with typical portuguese architecture. There is a nice town hall and a magnificent church in the center. On a hill, high above the town, you can see the chapel Nossa Senhora da Paz. You can walk, or drive, up to the chapel and get very nice views over the town and its surroundings. The staircase is nicely decorated with tiles with religious motives. Left of the chapel, if you are facing it, the trail to Monte Escuro starts. It is a rather steep walk up to the mountain that offers nice view over the beutiful landscape and the sea beyond Vila Franca do Campo. Next stop can be done in the small town Furnas, a popular target for tourists. 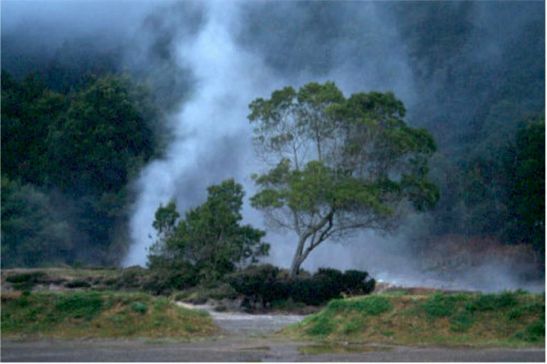 Just outside the town you will find the lake Lagoa das Furnas with its hot springs. Here is a nice camping ground. If you need some exercise there are a few trails around the lake. Close to the hot springs you can see holes in the ground or heaps of soil used for preparing food using the underground heat. Inside the town you will find the Hotel Terra Nostra. 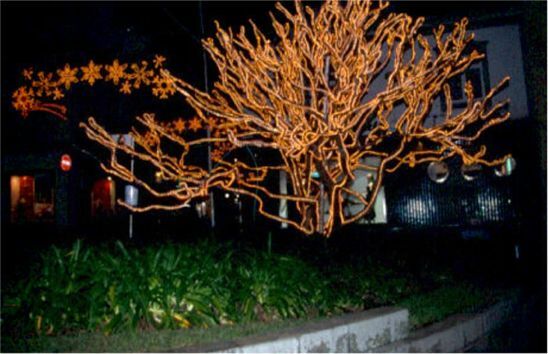 In the hotelpark you will find many tropical or subtropical plants as well as hot springs. If you have time, take a bath in the "Well of Youth". The easiest way to go to the small town Nordeste, on the northern coast of Sao Miguel, is to rent a car. The road from Furnas passes beautiful landscapes and a big waterfall. Just out side Nordeste is a well-managed restplace. From here you have nice views over the northern coast and the town. Nordeste is a small town with some nice old colonial buildings and an impressing townhall. My absolute favourite on Sao Miguel is the village Sete Cidades and its surroundings. You can take a local buss from Ponta Delgada to Sete Cidades. As there are very few connections one has to be careful and not miss the bus back to Ponta Delgada, otherwise you are stucked. 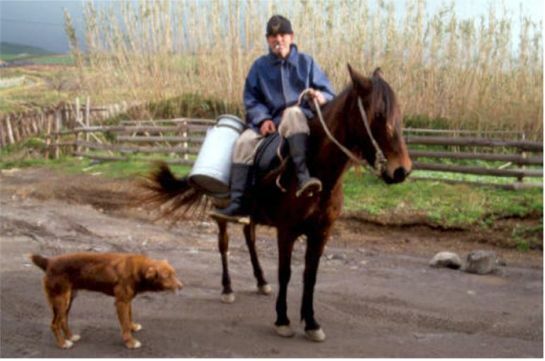 People are friendly on Sao Miguel so if you are lucky you could get a lift. 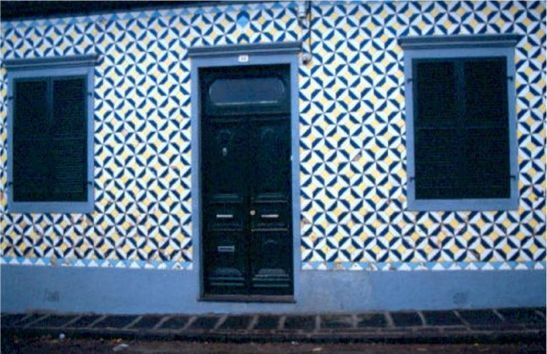 Sete Cidades is a quiet litte village with some nice old houses. You can see women dressed in black walking in the street and the village looks very peacefull. The whole atmosphere is oldfashioned in Sete Cidades. 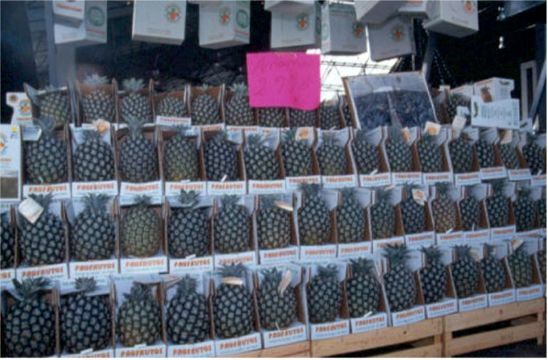 The village is located in a volcanic crater. In the bottom of the crater you find the "Twin Lakes". The water in the northern lake is blue, in the southern it is green. The colours were created when a princess and here lover, a young shepherd, had to take farewell from each other. They cryed so much that their tears created the two lakes, according to a legend. I trekked a whole day in the surroundings of Sete Cidades and explored the beautiful nature. You can spend several days of walking around here without getting bored. There are several nice viewpoints around the lake. One of the best is "Vista do Rei", from where you see the village and the both lakes. Mosteiros is a little town on the north western part of Sao Miguel. It is nicely located at the sea and has a harbour with a ligthhouse. In the center is a large church. Mosteiros can be reach in different ways. You can trekk to the town from Sete Cidades. I took the local buss from Ponta Delgada to Ginetes, where you switch bus for Sete Cidades. From Ginetes I walked through the village towards the sea and reached a small gravel road close to Ponta da Ferraria. Here you have a viewpoint giving you nice views over the sea. The gravel road follows the sea among fields and some farmerhouses. The walks give you a nice contact with the countryside of Sao Miguel. The day I walked from Ginetes to Mosteiros was sunny and clear, but very windy. I had two further trekkingdays on Sao Miguel during my stay. Both days had terrible weather, so my walking days were, more or less, destroyed. One of the days I tried to reach Monte Escuro from Vila Franca do Campo. After one and a half hour with sunshine the weather became windy and misty. I trekked three hours from the Chapel Nossa Senhora da Paz on a steep trail uphill before I gave up due to dense mist. The other day I descided to trekk to Lagoa de Fogo, The Firelake. This is one of the nicest walks on Sao Miguel. Also this day was destroyed by wind and mist, unfortunately. For coming to the starting point of this trekk I took the local bus from Ponta Delgada to the small village of Agua de Alto. From here you can have a nice walk to the lake, if the weather is good. The walk was pleasnt in the beginning, but after a couple of hours it became very windy and the mist swept down from the hills. It became cold and the sight was decreased to maximum 10 - 15 meters. The screaming seabirds unveild that I was close to the lake, even if it was invisible. You take a risc with the weather when visiting Sao Miguel in December. For best possible weather you should come during the summer months or early autumn. Even if the "Weather Gods" not always were on my side during my visit on the island I am very content with my week on Sao Miguel. The nature was marvelous and the people very friendly. I would like to come back in summer for better views, nicer trekking and to see more flowers. The Portuguese flag was introduced in connection with the dethronation of King Emanuel II in 1910. At the same time the Portuguese Republic was declared. The red and green colours in the flag comes from the portuguese Avisorden and the Orden of Christ. 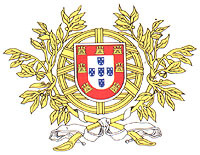 Behind the shield in the crest there is a navigation instrument symbolizing the long trips of the portuguese sailors. The seven castles in the red part of the shield is remaning of King Alfonso I:st captures during the 12th century. His victory over five morian kings in the battle of Ourique in 1139 is symbolized by the five blue shields.